A fight between undisputed cruiserweight champion Oleksandr Usyk 15-0 (11) and former WBC cruiserweight champion Tony “Bomber” Bellew 30-2-1 (20) is inching closer with news that representatives of the two camps met in France to discuss the potential fight. 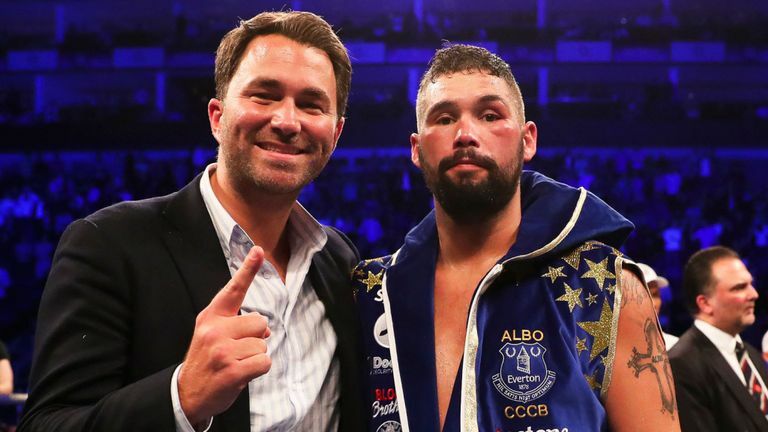 Matchroom Boxing’s Eddie Hearn had a sit-down with Alexander Krassyuk of K2 Promotions this week with the British boxing doyen saying progress was made. “I had a very positive meeting in Paris yesterday and again today with Alexander Krassyuk from K2,” Hearn told Sky Sports. Usyk, a 31-year-old Ukrainian southpaw, stamped himself as the best boxer in the world at 200-pounds after seeing off the challenges of Marco Huck, Mairis Briedis and Murat Gassiev to win the inaugural World Boxing Super Series tournament. Bellew hasn’t made the cruiserweight weight limit in almost two years. The 35-year-old Liverpudlian is coming off back-to-back stoppage wins over former unified cruiserweight champion and heavyweight titleholder David Haye. The Merseysider has previously stated he will only return to the cruiserweight division for a high profile fight. “It’s a brutal, brutal fight, but Tony is ready to roll the dice to become undisputed champion,” added Hearn. Bellew won the vacant WBC cruiserweight title from Ilunga Makabu of the Democratic Republic of Congo with a TKO3 at Goodison Park Stadium in Liverpool in May 2016. He made one successful title defence five months later against American BJ Flores, also stopping him in three at Liverpool’s Echo Arena.